The third part of my 2014 North American Soccer Prospect Handbooks after producing the 2015 Top 100 MLS Homegrown Signings and Draft Prospects. The 2014 Top 50 USL Pro Prospects including top 25 players currently under MLS contracts in USL Pro. 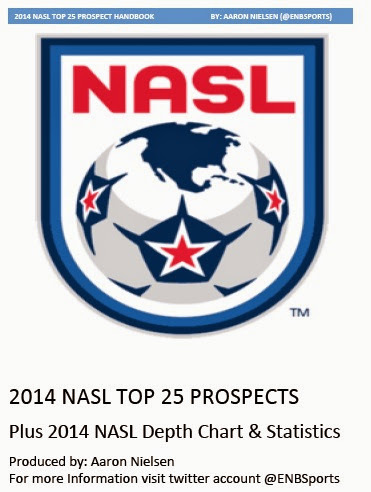 This handbook covers the 2014 NASL Top 25 prospects who I feel are the most ready for MLS. I covered the second and third tier of American soccer since 2004 but have had a relationship with the league 10 years earlier. I also wrote articles on the top via RedNationOnline.ca and included some relating to NASL within this handbook. I also added the final statistics and depth chart for all 2014 NASL clubs to further evaluate the players in my list as well as giving a complete perspective of the league.